UniMatch® Classical belts are designed to perform in tandem in multiple V-Belt drives, maintaining drive efficiency and belt performance. Megadyne’s Multi-Plus® V-Belts are designed to perform in tandem in multiple V-Belt drives, maintaining drive efficiency and classical belt performance. Multi-Plus® V-Belts are always matched, easy to install and maintain. 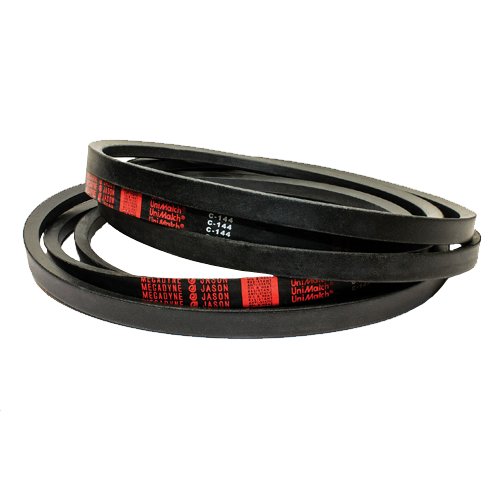 Multi-Plus® V-Belts come in a complete range of sizes, are anti-static and offer oil and heat resistance meeting RMA requirements. Dual Branding – A and B section belts up to 100″ are Dual Branded, clearly identifying both RMA classical and fractional horsepower (FHP) sizes, allowing consolidation of your classical and FHP inventory into one belt line – saving you money! No need to carry two separate product lines. The dual part number system is more than just labeling, too. FHP & Classical belts have the same top width dimension but classical profile is deeper, allowing more belt/pulley contact and reducing sheave wear. Conforms to ARPM standard IP 20. Are you interested in UniMatch Classical?